THE PLAINS, Va., April 3, 2012 – The Virginia Gold Cup Association announced today that Epic, the Washington, D.C., region’s premier acapella female quartet, will start off this year’s Virginia Gold Cup races with its four-part harmony rendition of the Star Spangled Banner. Epic will also perform for attendees throughout the day-long event, which takes place Saturday, May 5, 2012 at Great Meadow in The Plains, Virginia. The Virginia Gold Cup, one of the largest steeplechase races in the country and Virginia’s answer to the Kentucky Derby (now in its 87th year) is also one of Washington D.C.’s largest outdoor events. The event enjoys 50,000 spectators with six races and a day of parties and networking in spectacular Virginia horse country. In addition to the races there are Jack Russell Terrier races, tailgate and hat contests, and vendor booths for great shopping. 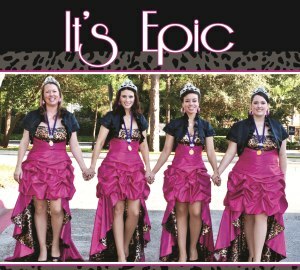 Epic, a female acapella quartet specializing in barbershop harmony, performs regionally and is slated to compete in acapella competitions across the country in 2012. The singers were recently recognized as the second place finishers in the Mid-Atlantic Harmony Sweepstakes competition, a popular acapella festival held annually at the historic Birchmere Theater in Alexandria, Va. Epic is a vibrant quartet filled with an impressive blend musical and life experiences. Its members are Kristina Adams (baritone), Anne Albright (lead), Shana Oshiro (bass), and Christina Lewellen (tenor). Tickets for the Virginia Gold Cup on May 5 are available at area Harris Teeter stores and online at www.vagoldcup.com. The cost is $85 for a car pass that admits up to 6 occupants and a vehicle. Member’s Hill passes are $45 per person. Great Meadow is located just 45 minutes west ofWashington,DC, and is in close proximity to Dulles International Airport. To get there fromWashington,DC, take I-66 west to The Plains exit. Turn left at the end of the ramp onto The Plains Road (Route 245 south), follow signs to Great Meadow which will be on your left. Call 540-347-2612 for additional information or visit the web site at http://www.vagoldcup.com. The Virginia Gold Cup Races are sponsored by Infinitive, Audi, United Airlines, M.C. Dean, Washington Fine Properties/Armfield, Miller & Ripley, and Rutherfoord. Race day activities are underwritten by Willowsford, Geico, Merck, Plato’s Closet and the Virginia Lottery. Epic is a vibrant quartet filled with an impressive blend musical and life experiences. Its members are Kristina Adams (baritone), Anne Albright (lead), Shana Oshiro (bass), and Christina Lewellen (tenor). The quartet finished second in the popular Mid-Atlantic Harmony Sweepstakes competition, and will participate in barbershop competitions across the nation as part of its 2012 performance schedule. Visit EpicQuartet.com to learn how the quartet aims to fill its days with Epic laughter, Epic music, and Epic shoes!